Ships from and sold by Marvel Books (We Ship Worldwide!!!). Three barbecue devotees, John Shelton Reed, Dale Volberg Reed, and William McKinney, trace the origins of North Carolina 'cue and the emergence of the heated rivalry between Eastern and Piedmont styles. They provide detailed instructions for cooking barbecue at home, along with recipes for the traditional array of side dishes that should accompany it. The final section of the book presents some of the people who cook barbecue for a living, recording firsthand what experts say about the past and future of North Carolina barbecue. Filled with historic and contemporary photographs showing centuries of North Carolina's "barbeculture," as the authors call it, Holy Smoke is one of a kind, offering a comprehensive exploration of the Tar Heel barbecue tradition. Starred Review. North Carolina barbecue may be the most complex of a decidedly complicated American tradition, with perennial battles over sauce, meat, wood and countless other factors. Married collaborators the Reeds (1001 Things Everyone Should Know About the South), along with Carolina BBQ Society founder McKinney, help 'cue fans navigate the smoky waters of North Carolina cuisine-its history, practice and players-in this expert guide, tempered with a smart sense of humor and true love for the food (Carolina transplants, the Reeds don't take the region's legacy lightly). The Reeds trace the evolution of the cooking style from its first appearance in the late 1600s, revealing the 19th century origins of the vinegar-based sauce synonymous with the state. Though the focus in on pork, the Reeds delve deep into all facets of the cuisine, including its social and political significance, and offer tips on picking one's restaurants wisely, a blueprint for building your own pit, and recipes. 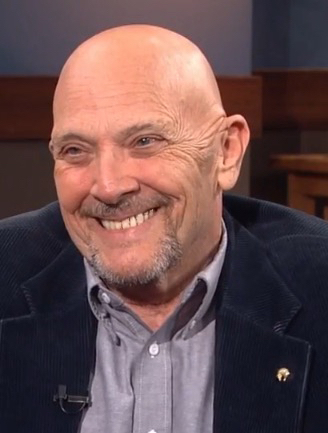 Would-be Carolinian pit-masters will learn all they need about smoking butts as well as whole hogs, whipping up crucial sauces and sides, and preparing dessert (from homemade Krispy Kreme Bread Pudding to Moon Pies and wine jelly). Even if readers never attempt to recreate the region's trademark delicacies, they'll certainly gain a deeper appreciation and understanding for this remarkably complex regional style and the characters who keep it alive. 260 illus. 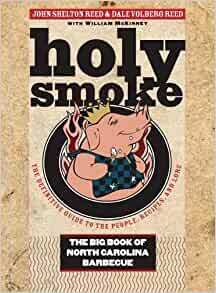 Start reading Holy Smoke: The Big Book of North Carolina Barbecue on your Kindle in under a minute. The BEST writings describing the Piedmont Recipes of North Carolina and surrounding area's history I've ever come across. Made some changes for myself in smokin' and flavoring the hogs I've killed on my property already. Fact is the day I recieved the book I killed a young pigglet that night! This book covers the bases of North Carolina Barbecue. 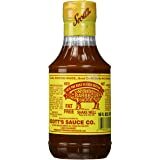 It discusses the history of North Carolina Barbecue, how to cook pork shoulders and whole hogs, gives recipes for famous Eastern and Piedmont barbecue sauces and various side dishes and desserts, and has interviews with the foremost North Carolina barbecue restaurant owners who cook in the traditional style. The book is fun, interesting, and informative. Highly recommended. Though not a graduate of UNC-Chapel Hill, I am nonetheless Tar Heel born, bred, and someday dead--and I revel in the delights of this book. If you crossed M. F. K. Fisher with Charles Kuralt, you'd end up with something close to the authors Reed in their bountiful appreciation of North Carolina barbecue: its history, nuances, and delectable controversies. Though a lot of research has been invested in this book, there's nothing heavy-handed about it: this is regional gastronomy at its finest, copiously illustrated and written with wit. The aroma of Carolina 'cue almost wafts from its pages. There is no higher praise. I like to learn the origins of how something came to be. This book definitely gives you that, and explains the intra state rivalry that has existed here in NC for as long as I remember even in my own family. My father was from the mountains, and his brother was a coastal guy. They'd argue at every cookout about what good Carolina BBQ really was, and I never really got it until I read this book. Good historical references, and some good recipes for 'Real Carolina BBQ"! What's not to love about this book. 5.0 out of 5 starsLots of good Eastern NC history here. I'm giving this as a gift, but I skimmed it. It brought back lots of childhood memories of Eastern NC. If you would like to know the history of true art of BBQ in different states throughout the south, buy this this book. There is extensive information on origins of recipes. This was a gift, but I've had the opportunity to read through on the road. He's a big Carolina BBQ fan and likes to hit a new place along with at least one old favorite on every trip to NC. This was perfect! The photos, history and anecdotes set this book above the rest. It's not just a tour guide. Very well put together! 5.0 out of 5 starsPart cookbook part history book. Love it! This is a very interesting and educational book. It explains the various styles of North Carolina Barbeque, and the history behind them. Many of the old school Barbeque joints around the state are hi-lighted and described and recipies and instructions are mixed in as well. I collect Barbeque books, and this is one of my favorites.